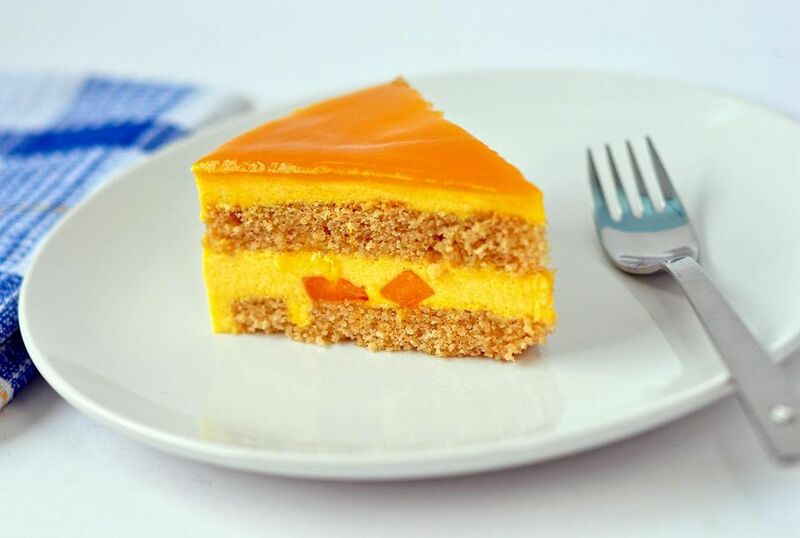 This sponge cake filled with mango mousse is quite spectacular. It looks professional but is doable if you use a springform pan. Sponge cake lines the sides and bottom of the pan, which is then filled with mousse and another layer of cake. The sponge cake is soaked with a fruit-flavored syrup, which complements the delicate sweet-tart flavor of the creamy mousse. This beautiful cake will wow guests. If you're in a rush, you can use store-bought ladyfingers for the sponge cake. Decorate the top of the cake with fresh sliced mangos or raspberries for an extra-beautiful effect. Note: while there are multiple steps to this recipe, this cake is broken down into workable categories to help you better plan for preparation and baking. Beat the egg whites with a standing or hand mixer until stiff. Slowly add the sugar and continue to beat until you have a stiff and glossy meringue. In a separate bowl, whisk the egg yolks until they are well-mixed. Whisk 1/4 cup of the meringue into the egg yolks. Fold the egg yolk mixture gently back into the meringue with the vanilla and coconut flavoring. Gently fold the flour and salt into the meringue, in two parts, until the flour is just mixed in. Place the mixture in a ziplock bag, seal, and cut off one corner to make a 1/2-inch wide hole. Place a piece of parchment onto a baking sheet. With a pencil, lightly trace the inside diameter of a 9-inch springform pan in two places. Fill in the circles with the cake batter, piping it in a spiral fashion. You should use about half of the cake batter to fill the two circles. On a separate baking sheet lined with parchment, mark with a pencil two bands with a width equal to the height of the springform pan. The bands should be about two-thirds the length of the cookie sheet, enough to line the inside of the springform pan with a little extra in case of mistakes. Pipe diagonal lines of batter to fill the bands. These bands of cake will line the springform pan. Dust the top of the cake pieces with powdered sugar. Bake for about 10 to 12 minutes, until just golden brown. Remove the cakes from the oven and peel the parchment off the backs while still warm. Bring the sugar and water to a boil and boil for 2 minutes. Generously brush the bottom and inside walls of the springform pan with melted butter. Place one circle of cake in the bottom of the pan, trimming to fit if necessary. Brush the cake generously with the syrup. Brush the plain sides of the bands of cake with syrup and place them in the pan so that the visible stripes face outward and are pressed against the sides of the pan. Trim them so that they fit tightly into the pan, completely lining the sides. Puree the mango with the lime juice until smooth. In a bowl, sprinkle the gelatin over 1/4 cup of water and let rest for 5 minutes. Place the bowl over a pot of simmering water (do not let bowl touch the water) and stir until the gelatin is dissolved. Stir the mango puree into the gelatin and mix well. Strain once more and set it aside. Bring the sugar and 1/4 cup water to boil in a small saucepan. Leave the mixer on the lowest speed until the sugar syrup reaches 248 F, then remove the syrup from the heat and slowly pour it into the egg whites while continuing to beat them. When the egg whites are stiff and shiny -- now a meringue -- stir 1/4 cup of the meringue into the mango puree. Fold this mango mixture back into the meringue. Gently fold the whipping cream into the meringue-mango mixture. Fill the cake pan halfway with the mousse mixture, spreading it over the circle of cake on the bottom. Place the other circle of cake on top. Brush the cake generously with the rest of the syrup. Fill the pan to the top with the mousse, using a long spatula or the flat side of a knife to smooth across the top, making it level with the top of the pan. Place the cake in the freezer for 2 to 3 hours. Remove the cake and place it on serving platter. Using a hairdryer, gently warm the outside of the springform pan. Carefully open the band of the pan slightly and lift the sides up and off the cake. Decorate the top of the cake with fresh mango slices or raspberries. Chill the cake until you are ready to serve.